Open registration for spring 2017 begins November 13. Note: Corporate and Continuing Education registration begins November 3 and is ongoing throughout the term. For more information, call 704.330.4223. 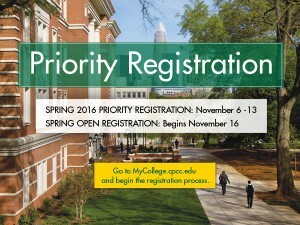 For more information about registration, call 704.330.2722 or visit www.cpcc.edu/admissions. Priority Registration is Around the Corner! Open registration for summer and fall 2016 begins May 2. Note: Corporate and Continuing Education registration for summer classes begins April 22 and for fall classes is July 7 and is ongoing throughout the term. For more information, call 704.330.4223 . Open registration for spring 2016 begins November 16. Note: Corporate and Continuing Education registration begins November 6 and is ongoing throughout the term. For more information, call 704.330.4223 . 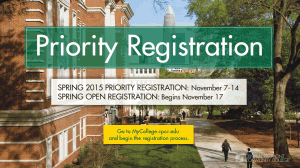 Priority Registration Starts This Week! Remember to register early for the best selection! Open registration for summer and fall 2015 begins May 4. For more information, call 704.330.2722 or visit www.cpcc.edu/admissions. Note: Corporate and Continuing Education registration for summer classes begins April 24 and is ongoing throughout the term. For more information, call 704.330.4223. 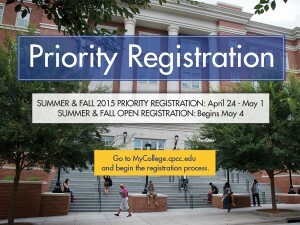 Go to MyCollege.cpcc.edu and region the registration process. Registration is coming THIS Friday, do you have Priority Registration? Open registration for summer and fall 2014 begins May 5. Summer registration ends May 20 and fall registration ends August 17. Note: Corporate and Continuing Education registration begins April 25 and is ongoing throughout the term. For more information, call 704.330.4223. The information below provides priority dates and times for currently enrolled students and the first open registration date for new and returning students. 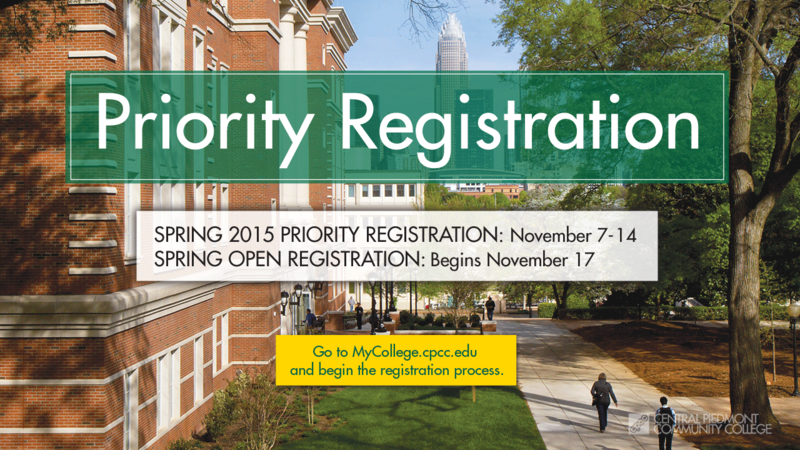 If you are a currently enrolled student, you have also received notification of your assigned priority registration date via your CPCC email account. For more information, call 704.330.2722 or visit www.cpcc.edu/admissions. Note: Corporate and Continuing Education registration for spring classes begins Nov. 1 and is ongoing throughout the term. For more information, call 704.330.4223. 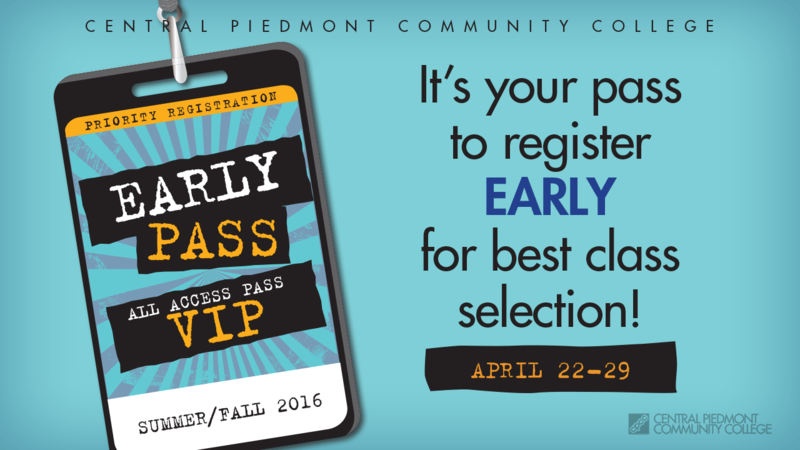 Registration begins Friday, do you have Priority Registration? Find more information about Priority Registration at http://www.cpcc.edu/ican/get-advised. 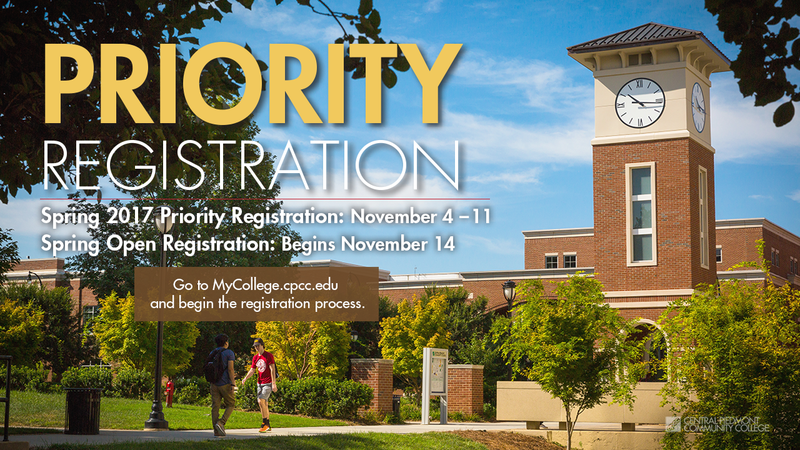 Registration is coming next Friday; do you have Priority Registration?